Pulling strands from several silkworm cocoons at once makes the thin strands twist into a silk thread. 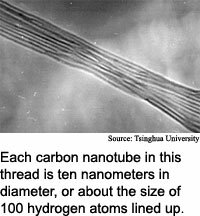 Researchers at Tsinghua University in China have hit upon a similar method for making thread from tufts of microscopic carbon nanotubes. The researchers discovered the thread-making method by accident. After developing a method of growing closely packed, vertically aligned arrays of carbon nanotubes on silicon surfaces, they attempted to pluck a clump of nanotubes from an array. But instead of cleanly capturing a clump, they found they were pulling continuous threads of nanotubes. "We found that the super-aligned arrays can serve as cocoons from which pure carbon nanotube yarns can be continuously drawn out," said Kaili Jiang, a lecturer of physics at Tsinghua University. Carbon nanotubes are among the strongest objects known, and the researchers' threads, just two tenths of a millimeter in diameter but up to 30 centimeters long, could be used to make ropes and fabrics that have unusual properties. The nanotube yarn could be used to make bulletproof vests and material that blocks electromagnetic waves, according to Jiang. "Our pure carbon nanotube yarn, after proper heat treatment, should be able to be woven into a variety of macroscopic objects for different applications, just as silk thread [is used] in the textile industry," he said. Two existing methods of making thread from nanotubes involve suspending nanotubes in liquid and inducing a current to align the nanotubes, or using a flow of hydrogen gas to align nanotubes as they form in a vapor of carbon atoms. The researchers' method is simpler and could result in fewer impurities in the thread. The unique electrical and mechanical properties of carbon nanotubes are exhibited mainly lengthwise. Because of this orientation, long strands of nanotubes would extend these properties to a larger scale, said Shoushan Fan, a professor of physics at Tsinghua University. Unlike silkworm cocoons, which are made of single, continuous strands of silk fiber, the researchers' nanotube arrays contain millions of separate carbon nanotubes. The nanotubes in the researchers' arrays are 10 nanometers in diameter and several hundred microns long, said Jiang. A nanometer is one millionth of a millimeter, or about the length of 10 hydrogen atoms lined up. The tubes are multiwalled, meaning each contain several layers of carbon atoms rolled up into successively smaller tubes. The nanotubes join end-to-end due to the van der Waals force, a natural electrostatic attraction between individual electrically neutral atoms and molecules. The positive and negative charges within the atoms and molecules, while balanced, vary from part to part, resulting in a net attraction between neighboring atoms and molecules. The van der Waals force comes into play only for very small objects. The ordinarily weak van der Waals interaction is relatively strong between the nanotubes in the researchers' arrays because the nanotubes have very clean surfaces, said Jiang. This makes the nanotubes in the arrays inclined to form bundles, and link end-to-end to form yarn, he said. The thickness of the yarn depends on the size of the tip of the tool used to pull the nanotubes, with larger tips yielding thicker yarn, according to Jiang. The researchers estimate that a square centimeter array of nanotubes will generate about 10 meters of nanotube yarn. The researchers found that heating the yarn strengthened the junctions between nanotubes, increasing its tensile strength by more than six times, and also increasing its conductivity, said Jiang. The efficiency of the pulling process depends on the consistency of the pulling force and the precise alignment of the nanotubes, said Jiang. The pulling process only fails when there is an abrupt change in the pulling force, he said. "If a uniform pulling process is conducted automatically by some... machine, we believe that pulling failure will rarely occur," he said. The researchers have developed an interesting approach to making nanotube fibers, said Philippe Poulin, a materials scientist at the Paul Pascal Research Center in France. Poulin led a research team that made nanotube fibers by suspending nanotubes in a liquid. Drawing fibers from nanotubes grown on a substrate "is a big advantage for the purity and the alignment of the tubes," he said. But it's not clear how the process can be scaled up for production, he added. It is surprising that arrays of nanotubes held together by van der Waals forces can assemble into long strands, said Pulickel Ajayan, a professor of materials science and engineering at Rensselaer Polytechnic Institute. Ajayan led the team of researchers who adapted the carbon vapor method to form nanotube strands. The Tsinghua researchers' process could be limited by the amount of nanotubes they can produce, because "you can only grow so [many] nanotubes on a planar substrate," he said. The nanotube yarn could be ready for practical applications in five to ten years, said Jiang. Developing a process to make the thread in bulk will require a batch processing method for making the arrays of aligned nanotube, and a machine designed to pull the nanotubes into yarn automatically, he said. The researchers' next steps are to improve the strength of the joints and to develop applications for the nanotube yarns, he said. Jiang and Fan's research colleague was Qunqing Li. They published the research in the October 24, 2002 issue of the journal Nature. The research was funded by the Ministry of Science and Technology of the People's Republic of China, the National Natural Science Foundation of China and the Foxconn Industrial Group.